Mr. Waldron received his Bachelors Degree from Barry University in Florida and his Doctorate from Regent University in Virginia Beach, Virginia. His practice, Tom D Waldron, P.A, focuses primarily in Estate Planning and Real Estate which includes, wills, trusts, probate, trust administration, guardianships, partitions, and real estate contract. Mr. Waldron is also President and founder of a separate firm, Lawyers Real Estate, P.A., which has one practice area, real estate marketing and sales. 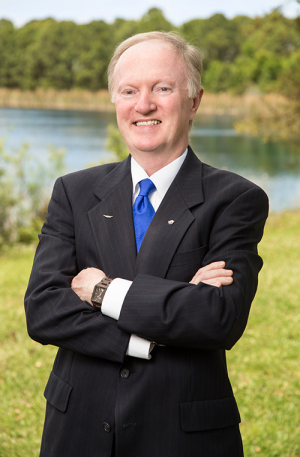 Registered with the Florida Real Estate Commission, Mr. Waldron taught Real Estate Principals Practices and Law for seven years at local community colleges and is Broker of Record and President of Lawyers Real Estate Brokerage, Inc.. Many of his clients come from word of mouth referrals and other law firms. Mr. Waldron believes that lawyers must serve their communities and serves as pro-bono legal counsel for many churches in Brevard County Florida, and the Azan Shriners in Brevard County in their efforts to raise funds for the Shriners Hospitals for Children. Mr. Waldron is a pilot and a reference attorney for the Aircraft Owners & Pilots Association (AOPA). Although none of his works are for sale, Mr. Waldron is also an artist. Many of his sculptures were recently highlighted on his latest real estate DVD. Whether your family would benefit from a Revocable Living Trust, probate, Irrevocable Spendthrift Trust, Life Insurance Trust, Guardianships, Power of Attorney, Living Will, Health Care Power of Attorney, or a Last Will and Testament, Mr. Waldron will be pleased to meet with you and your family to assist. Mr. Waldron offers free consultations on Estate Planning. Call (321) 725-7077 for an appointment or click here.